I love cookbooks. I love the weight of them and I love the pictures. I love flipping through them and I love the way they look on a shelf. 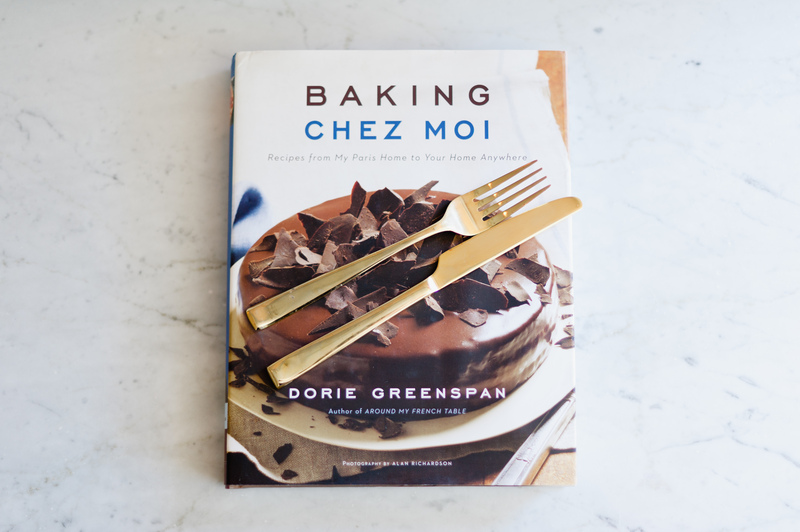 This pretty one, Dorie Greenspan’s Baking Chez Moi was a birthday gift and I couldn’t be more obsessed with it. I love Dorie Greenspans books… The ease, the writing, the pictures. They’re all great and this one is going tobet a whole lot of good use! I needed a little dessert for a lunch I hosted last week, and I was so thrilled to pull out this book. I started at the beginning, and pulled the very first recipe, a weekend cake. 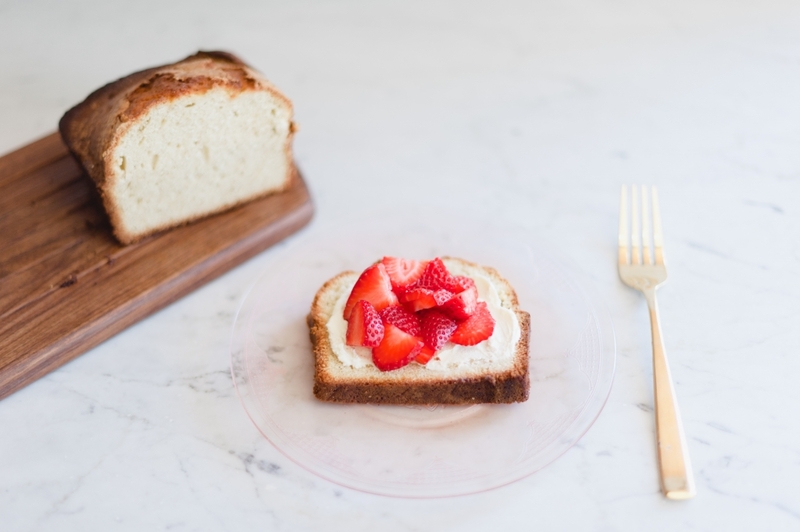 I love this concept… a simple but versatile cake that should last you through the weekend. You can eat it for dessert or with your morning coffee. It’s even better on the second day actually. And I imagine if it makes it to day 3, it would be really delicious toasted, with a little butter. Ahh, those French, they get me. I served it with a little marscarpone & strawberries, because that’s what I happened to have in my fridge. But plain, it was so good. Or with vanilla ice cream. Or with creme fraîche and any berry. I don’t think you can go wrong at all! Center a rack in the oven and preheat to 350 degrees F. Pull out an insulated baking sheet or stack two regular baking sheets one on top of the other. Line the (top) sheet with parchment paper or a silicone baking mat. Butter a 9-x-5-inch loaf pan, dust with flour and tap out the excess (or use baker’s spray). I suggest preparing the pan this way even if it’s nonstick. Set the loaf pan on the baking sheet(s). Put the butter in a small saucepan and bring it to a boil over medium heat, swirling the pan occasionally. Allow the butter to bubble away until it turns a deep honey brown, 5 to 10 minutes. Don’t’ turn your back on the pan – the difference between brown and black is measured in seconds. And don’t worry about the little brown flecks in the bottom of the pan – they’re a delicious part of the process. Remove the pan from the heat. Put the sugar and the vanilla-bean pulp in a large bowl and rub them together until the sugar is moist and fragrant. If you’re using vanilla extract, you’ll add it in later. Whisk the eggs into the sugar, beating for about 1 minute, or until they’re throughly incorporated. Still working with the whisk, beat in the extract, if you’re using it, then the heavy cream, followed by the rum. Continuing to whisk or switching to a large flexible spatula, gently and gradually store in the dry ingredients until you have a thick, smooth batter. Fold in the melted butter in 2 or 3 additions. Pour the batter into the prepared pan and smooth the top. Bake the cake for 55 to 65 minutes, or until a knife inserted into the center comes out clean. Take a look at the cake after it’s been in the oven for about 30 minutes; if it looks as if it’s browning too quickly, cover it loosely with a foil tent. When the cake tests done, transfer it to a wire rack to cool for 5 minutes, then unmold it and let cool right side up.